The main event for this event is Saturday, October 27th, 11am - 5pm. You must submit your Vendor Application and email 2-3 promotional quality images to info@apeoplepartyproductions.com. How much does a booth cost and how many vendors will be chosen? We are selecting vendors that are ready to show their best on their own. We’ve provided two booth options for various inventory sizes. 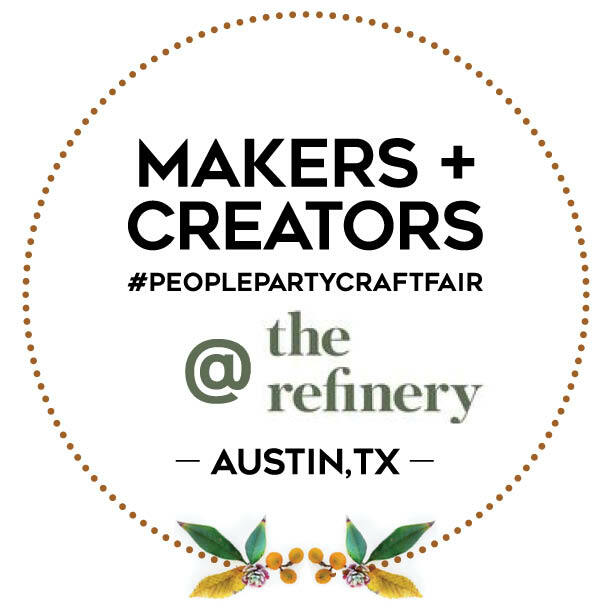 The Refinery is a shared creative studio + event space located in the heart of Downtown Austin. What is the space of the venue like? Is it indoors or outdoors? Will I have access to an outlet? We'll have access to outlets close enough for nearly every vendor to access. Be prepared with your own extension cord and safety electric tape to secure all loose cords to the ground. Yes! We'll provide you with your guest password at check-in. Will I have a wall behind me? We cannot assure you a wall or a that we can grant any specific requests, but will always do our best to place you in the best location based on your needs and the nature of your booth in relation to the space that is available, the structure of the venue, and how the event must work together as a whole. Will you provide tables? What about chairs? Is there an application fee and it is refundable if I am not accepted? There is a $10 application fee for al applicants. This covers the administrative time to review and correspond with all vendors, and is nonrefundable. We wish we could fit everyone in, unfortunately space is always limited. Vendors are selected based on providing a variety of goods that will connect with the vibe of this venue and curated space. Is my booth fee refundable if I'm unable to make it the day of the event? While we understand that their is always the possibility of unforeseen circumstances, keep in mind, cancellations create more work to make adjustments to the floor plan. We are willing to work with you up to 50% of the booth fee on a case by case basis until date here. After this deadline, booth fees are no longer refundable. What is APPP and The Refinery looking for in a vendor? We are looking for handmade and unique quality products. Our mission is to create a fun and friendly environment that provides more exposure for small shops and creatives #whereyoulive. Our craft fair events exhibit handcrafted and original items along with artists and musicians. How do I know if I’ve been selected as a vendor? You will receive an e-mail response within five days confirming your acceptance as a vendor with a link to pay and reserve your booth. All booths must be paid within 5 days of receiving your email confirmation in order to reserve your booth space. Does APPP or The Refinery ask for a commission? You keep 100% of your profit. Our application fees + admission continue to help us cover the cost of operations, event overhead, and also helps us continue to offer smaller booth options with lower booth rates. We also work additionally hard to try to secure new sponsors for each event, but these are never guaranteed. Will there be a cover charge for the public? Yes! As we have worked within the maker market industry, we have learned that adding a small cover charge not only helps us cover our expenses and time to curate and manage this event, it also brings quality shoppers that are serious about making purchases at our event. As our event grows, so do our expenses as we are now required to operate with event insurance and hire out more talent and paid roles in addition to our volunteers. General admission is $10. Vendors can load in on 7th street. We recommend you pull up as close as you can to the building on 7th and be sure to throw on your hazard lights. We'll have access to one rolly chart to assist with load in and load out if needed. We just ask the you are mindful of other vendors and make every effort to get in and out before you get started working on your booth. Once you are unloaded, parking for the day can be found here, here, and here. What if the weather is a problem the day of the event? This event will proceed regardless of the weather. Safety is our number one concern - please contact us if you feel you cannot attend due to unsafe driving conditions. How much inventory should I come with? It depends on you and your product. Some vendors have a business that sells products year round so they bring a little bit of everything. Some vendors do custom orders so they will have their table stocked with their signature items, and have a sign-up sheet for custom orders. Do we know how much foot traffic we can anticipate? How many vendors participate in APPP Craft Fairs and how many people attend them? Our number of vendors depends on the venue. We average 50+ vendors in our home base with approximately 1K+ shoppers throughout the duration of the event. How will I know when and where I will set up the day of the event? You will receive a map showing your booth location the week leading up to the event. Your booth will be numbered and we will help you locate your booth the day of the event. What time do vendors need to arrive to set-up? We are excited to have the evening before to set-up! For those traveling from out-of-town, you have the option of setting up within the two hours before the event. Can I offer a product as a promotional giveaway for your raffle? Yes! We would love to provide you with a little extra exposure! We will display your item at the entrance for the raffle to help us offset our costs. For more inquiries please feel free to send us an email at info@apeoplepartyproductions.com.